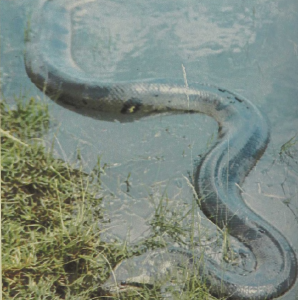 The great rivers of South America are the home of this boa, the largest of all snakes. Not only does it probably hold the record for length – with a total of about 37 to 38 feet – but clearly the record for weight, since an adult northern Anaconda 30 feet long would be over 2 feet in diameter, and such an animal would weigh at least half a ton. Since river and swampy regions often make it difficult or impossible to perceive the entire length of an animal, there are numerous tales of Anacondas much larger than those for which proper records have been taken. The Anaconda is essentially a water snake though specimens have been observed basking in trees or on the shores of river courses. It feeds on fishes, aquatic mammals, water birds, and the South American caiman, always constricting the prey first.